When it comes down to it, we’re all seeking the same thing in love: “The One” — that special person whose personality, interests, values, and goals mesh so well with our own that it feels as if we’re a perfect fit, as if we’ve known and loved one another for eons. 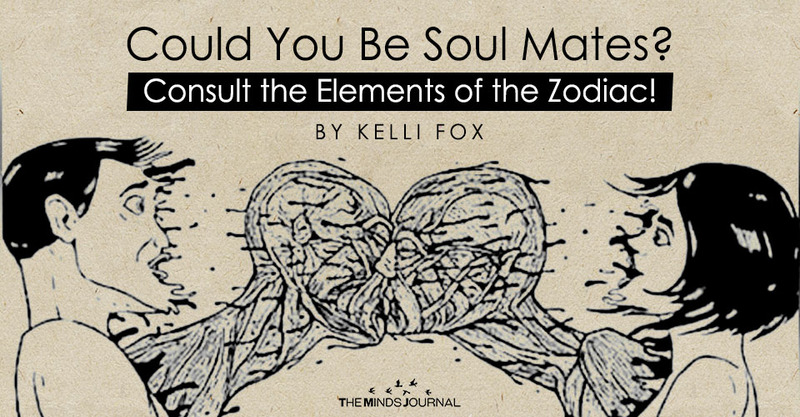 Here’s a secret from the Zodiac: There is a way to know early on whether your relationship stands a solid chance of becoming that rare, special connection you’re hoping for. Each Sun sign, from Aries through Pisces, is associated with a certain astrological element — Fire, Earth, Air or Water — that lends the sign particular qualities. It all comes down to the heated passions of Fire, the grounded stability of Earth, the clever intellect of Air, or the emotional depths of Water — and how any two given elements mix in love. When two people become romantically involved, their elements can either blend well together or clash with each other, causing tension and discord. To find out whether you and your sweetheart could be soul mates, find both your Sun signs in the following table. Then find your matched elements below to learn whether your soul mate probability is low, medium or high, according to the Zodiac. When two Fire signs are romantically involved, it’s passion meets passion, all the time. These two make quite an ardent couple; they can hardly keep their hands off each other. It follows, of course, that two Fire signs will occasionally go head to head in epic clashes — the kind of disagreements that could have smoke pouring from both lovers’ ears. That’s just part of the passionate connection these two shares, and for the most part, they can use their fiery clashes as fodder for some truly steamy make-up sessions. After all, life is just too exciting to waste much time holding a grudge. Soulmate probability: High, as long as conflict doesn’t become too much of a habit; constant arguments can undermine even the steamiest connection over time. When a Fire sign and an Earth sign are romantically involved, it’s a case of two people with very different qualities trying to make it work. And it could work out quite well in the long run, as long as Earth appreciates Fire’s high energy and ardent nature, and Fire values Earth’s grounded practical perspective. These are all important qualities in a long-term relationship, after all. The problem is, Fire and Earth can drive each other crazy, fast — they’re just so different! Fire may feel stifled by Earth’s relentless insistence on being sensible, while Earth might find Fire’s passionate nature to be too much high drama to deal with on a long-term basis. Kelli Fox is a professional astrologer who was first drawn to astrology during her childhood in Sydney, Australia. As early as eight years of age, she began recording birth dates and sun signs for anyone willing to share. Kelli’s formal astrological studies began at the College of Humanistic Astrology. Alia Ryder had her utmost respect as her mentor and teacher. This led to her professional accreditation with multiple organizations including: C.A., NCGR-PAA & National Council for Geocosmic Research, PMAFA & Professional Member of the American Federation of Astrologers ISAR C.A.P & International Society of Astrological Research, and the FAA – Federation of Australian Astrologers.